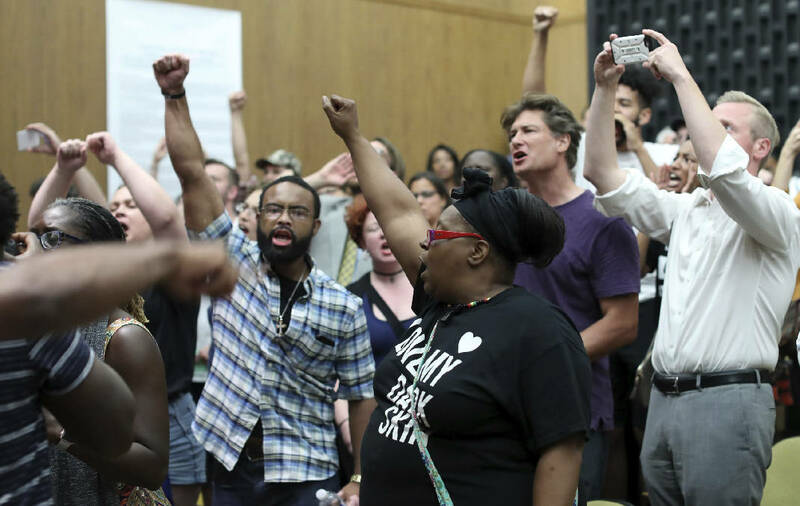 CHARLOTTESVILLE, Va. (AP) - Anger boiled over at the first Charlottesville City Council meeting since a white nationalist rally in the city descended into violent chaos, with some residents screaming and cursing at councilors Monday night and calling for their resignations. Scores of people packed the council's chambers, and The Daily Progress reported Mayor Mike Signer was interrupted by shouting several times in the first few minutes of the meeting. As tensions escalated, the meeting was halted. Live video showed protesters standing on a dais with a sign that said, "Blood on your hands." Speakers, some yelling and hurling profanities, then took turns addressing the council, some expressing frustration that leaders had granted a permit for the Aug. 12 rally that had turned violent. Others criticized the police response to the event, which drew hundreds of white nationalists and other counter-protesters. The event dubbed "Unite the Right" was sparked by the city's decision to remove a statue of Confederate Gen. Robert E. Lee. Neither a city spokeswoman nor a Charlottesville police spokesman immediately responded to questions from The Associated Press about reports that three people were arrested Monday. Elsewhere in Charlottesville, dozens of students rallied Monday night at the University of Virginia in rejection of the violence. Video of the event streamed by the newspaper on social media showed students marching on the stately grounds of Virginia's flagship public university.